I went a bit overboard on the weekend, two pies (sweet and savory) in two days, time for a change in my kitchen! Something lighter (that doesn’t involve butter) is on my mind, a salad with black Beluga lentils and fried beetroot slices. 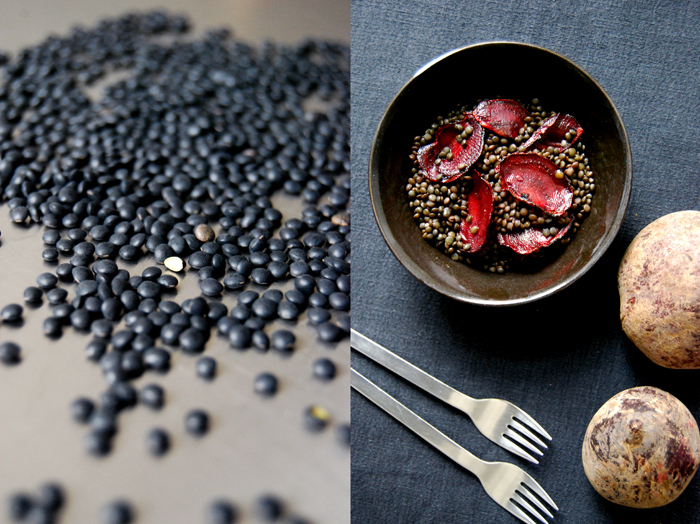 Beluga lentils are perfect for salads. They are tiny little legumes, with a strong and nutty taste and they just have to cook for 30 minutes without having to soak in water. The beetroot becomes a bit sweet when you fry the raw slices, even sweeter than when boiled in water. 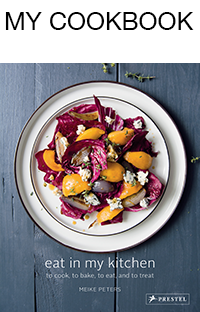 When it comes to salads, I prefer fewer ingredients with strong flavours and quick preparation. I’m not too fond of salads which mix up lots of different vegetables and fruit as the single tastes tend to get blurred. 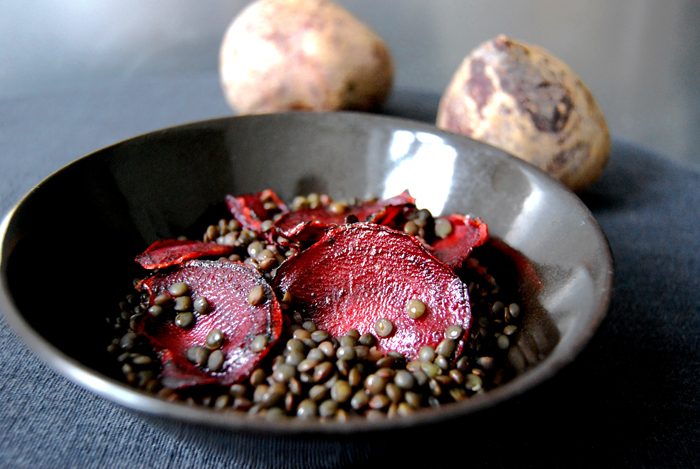 Today’s salad is a dark beauty, the lentils are dark grey, nearly black with shades of blue and green and the beetroot slices deepen to a dark red when you fry them. 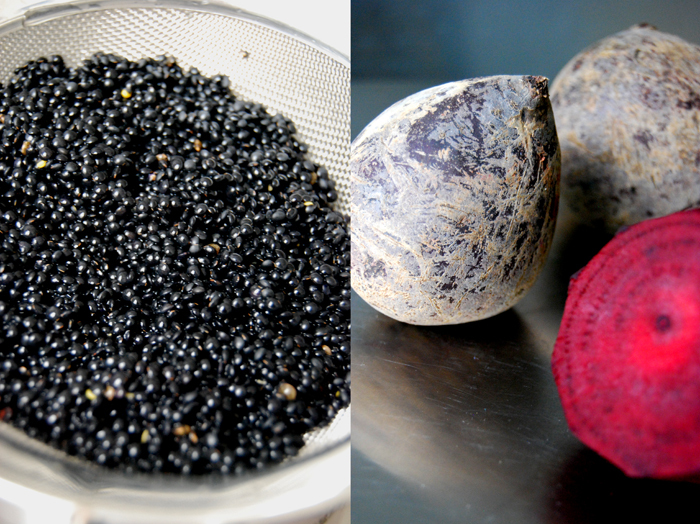 All you need for a salad for 4 is 1 cup / 200g of Beluga lentils, rinsed and cooked in 3 cups of water (without salt!) for 20-30 minutes. While they are simmering, I slice 2 large uncooked beetroots with a slicer very thinly. I heat some oil in a large pan, sprinkle the beetroot slices with a pinch of sugar and fry them in batches for a few seconds on each side before I season them with salt and pepper. They burn quickly which gives them a bitter taste so you have to watch them. My dressing is very simple and light, 3 generous tablespoons of olive oil mixed with 1 tablespoon of freshly squeezed lemon juice and 1 tablespoon of white Balsamico vinegar, seasoned with salt and black pepper. When the lentils are done I rinse them with cold water, drain them and pour the dressing on top. You may have to add more salt and pepper at this point to taste. I lay the beetroot slices on top and the salad is ready to be served!